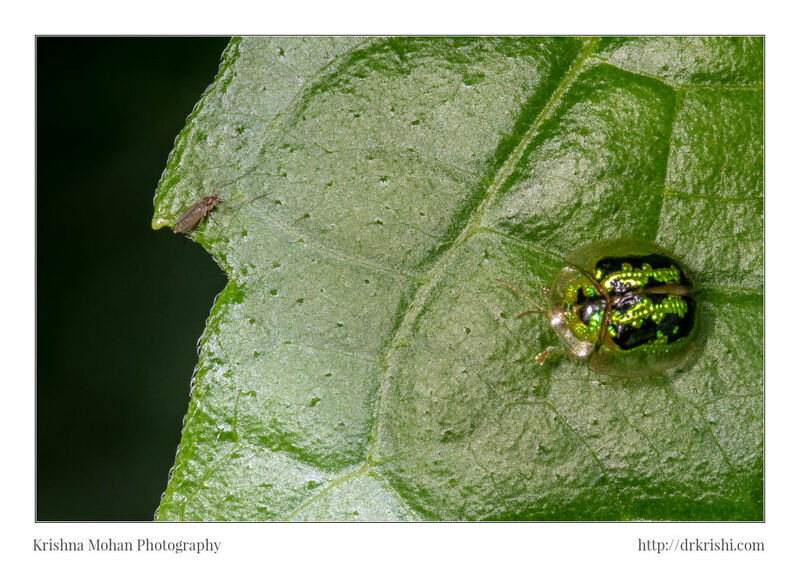 I found this Green Tortoise Beetle (Cassida circumdata) in my garden last Sunday. I was using Canon EOS 5DS R with Canon EF 100mm f/2.8L Macro IS USM illuminated by Canon MT-24EX macro twin light flash. My homemade plastic diffuser was used to diffuse the light. 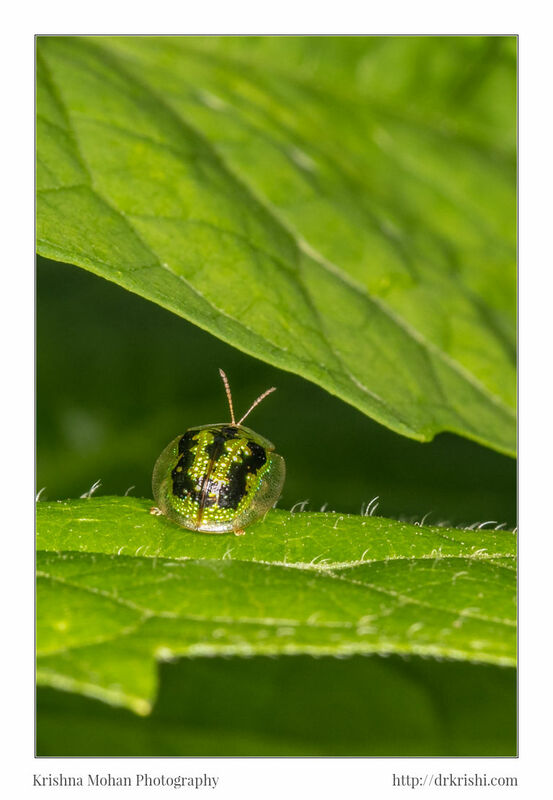 Despite my best effort you can see some specular highlights on the body of the tortoise beetle. 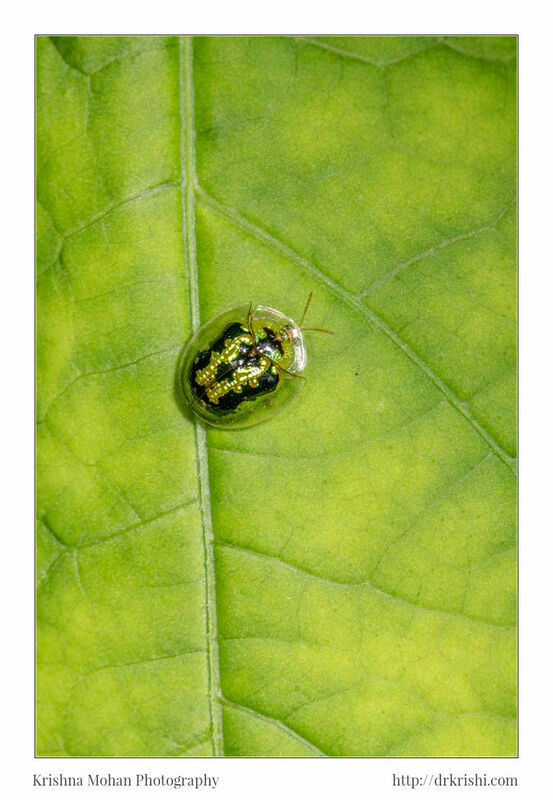 That diffuser needs some serious reworking to get best results on highly reflective critters like this beetle. 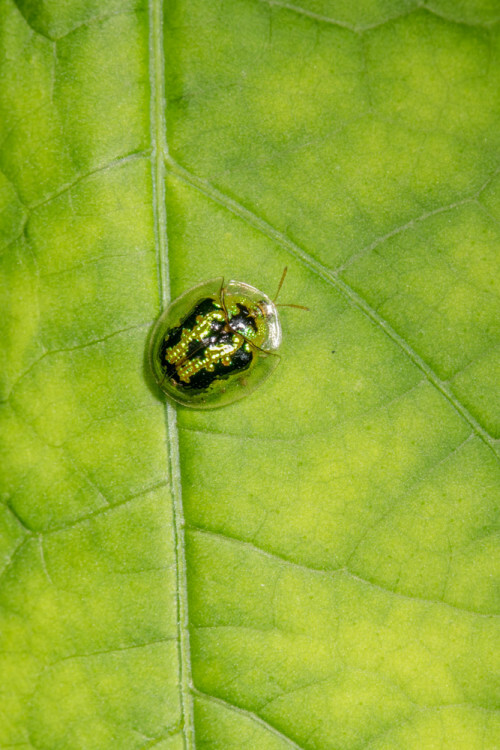 Tortoise beetles belong to the sub-family Cassidinae, of the family Chrysomelidae (leaf beetles). These beetles are so called because of their peculiar shape resembling that of tortoise, or turtle. These are all leaf eating beetles and are often conspicuously coloured. Even though these beetles are easily recognized due to their characteristic shape, many confuse them with lady-birds. 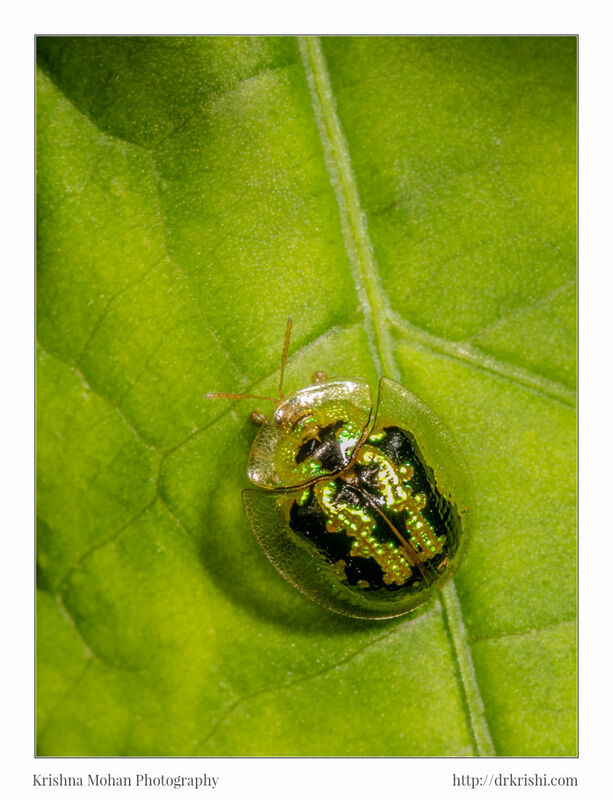 Although the lady-birds look like the tortoise beetles, they do not belong to the family Chrysomelidae; they belong to the Coccinellidae. 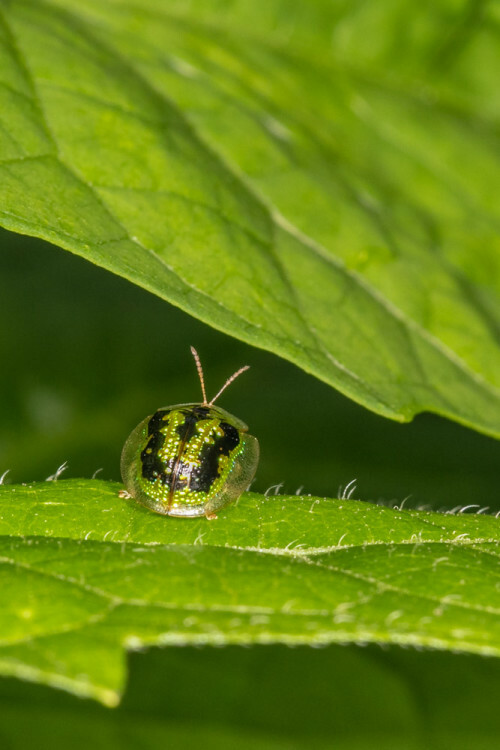 The tortoise beetles, like the rest of the family Chrysomelidae are phytophagous, or feeding on plants, but most of the lady-birds are predaceous on other insects. The lady-birds are good natural control agents for some of the agricultural pests, such as brown planthoppers, aphids and mites. 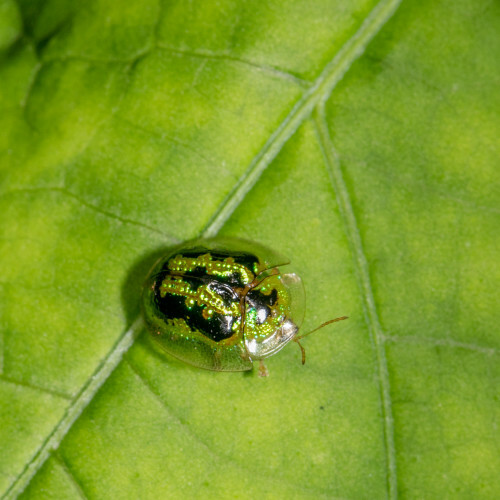 The tortoise beetles are considered by many as plant pests. 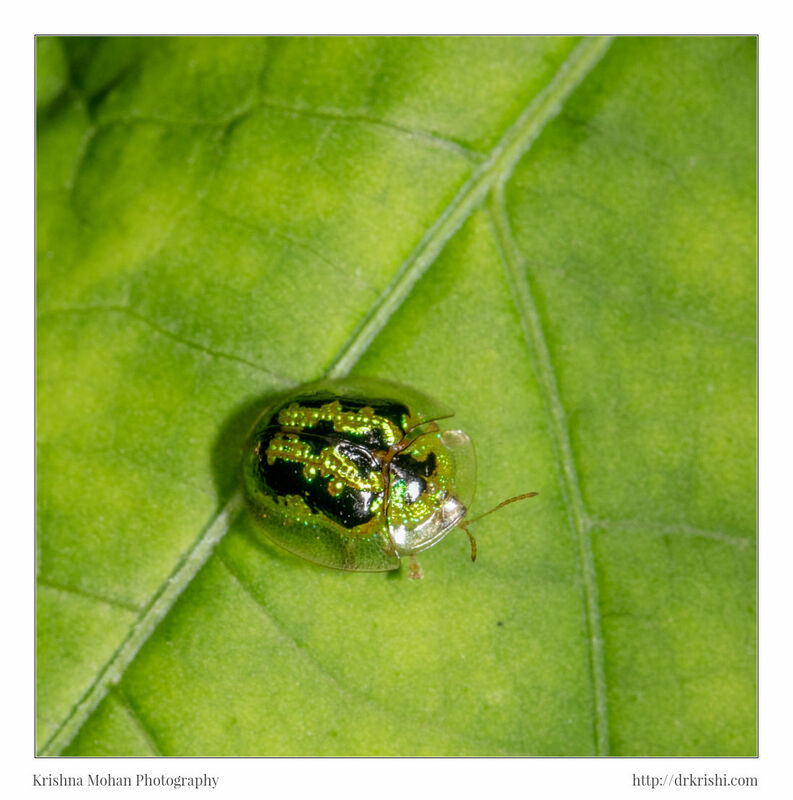 Green Tortoise Beetle is one of the most common species of a beetle during rainy season, especially June-September. 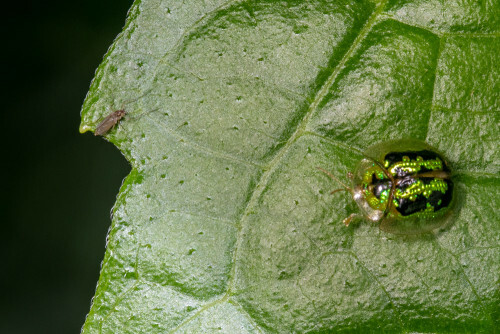 The larvae feed on the upper as well as on the lower surface of leaf (mostly prefer upper side), while the adults feed only from the lower surface of the leaf. 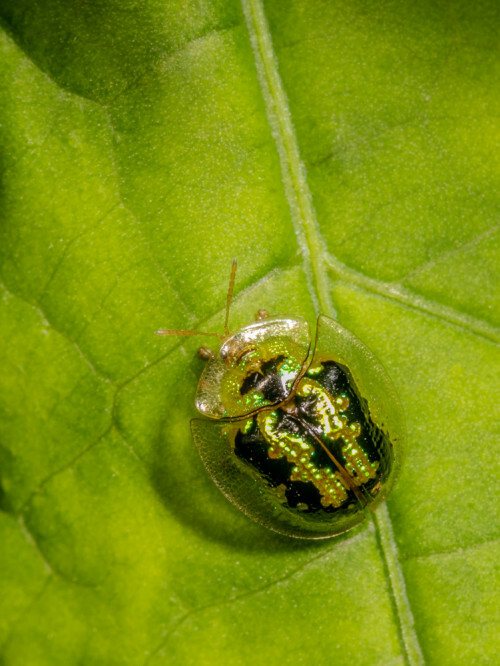 The feeding is in the form of small, distinctly circular holes of about 3 mm in diameter. It breeds round the year at suitable plants, belonging to Convolvulaceae family, especially on water spinach (Iopemea aquatica), Yam & sweet potato. The life cycle takes about 40 days. A single female may be responsible for about 350 larvae, of which at least half will reach maturity. The larva looks very ferocious, with the body covered with spines. These beetles are not listed as the major pest, although they may cause some damage to the foliage of sweet potato plants. Very good photos and summary.